For those in charge of their company, brand or organization’s Instagram account, important decisions are made daily. One of the toughest tasks is delivering a full schedule of Instagram content to promote and share. And for the majority of these folks, it’s insanely easy to fall into creative block for new post ideas. Coming up with Instagram post ideas is a challenge, but also something that just needs a little creative thinking. If you use Instagram management tools to accurately detail what content, hashtags, analytics and posting times are the most successful, you’re immediately ahead of the game. However, just getting the Instagram post ideas on paper can be what’s holding you back. You’ll read about behind-the-scenes content often when searching for new Instagram post ideas. But when it comes down to it, these types of videos and photos work. For highly visual and engaging content, you have to entice the viewer and ultimately create a sense of pleasure or intrigue. More likely than not, people are interested in how your company works on a daily basis. Try to highlight quirks or unique happenings that occur with your business. If it’s a retreat, a company event or something silly your staff does every Friday, tell your audience about it. When you make your brand unique, you inspire curiosity. Instagram is a great place to show how something very specific to your company is made. Even some of the more typically “boring” brands are able to entice excitement or wonder by showing off some of the daily operations. It’s not uncommon for Instagram users to judge a book by its cover instead of a single page. Your Instagram profile is what you ultimately want to drive people to mostly because it’s your one spot for a link. And while links are important in your Instagram bio, so to is the first view of all your images and videos together. Collaging images together–whether it’s a color theme or like Reynold’s Wrap, who endlessly connects all images–can attract more followers and hype around your profile. Following this Instagram post idea will help you keep the content coming for weeks with your new theme. Do you have an amazing image or video to share? What about a boring or plain piece of content, but the story behind it is crazy? It’s not a bad idea to post content where the story drives the image. Instagram itself commonly uses in-depth stories to drive its imagery. The point is to move you with the image and the context of the post. Your brand can easily do this by explaining why this image is important or what significance it has with your brand. If it’s truly engaging, people will read it, follow and look for content like it in the future. Your product is what makes your company unique–so use Instagram to showcase it. For example, Post It frequently uses its products on Instagram content to show fun and inventive ways to turn boring tasks into exciting ones. By taking liberty to get a little creative with your product, you not only give readers a good idea, but you also show how your product can get them there. You don’t have to only use stock photos of products in good lighting. Instead, push creative content through Instagram and show users how your product is used by different people in the industry. Forever 21 isn’t trying to sell you items for your dog in the example below. The company is pushing the cuteness of the dog and the headband together. There’s no doubt user-generated content is one of the most powerful content sources for social media today. And on Instagram, more brands than ever rely on UGC to promote their products and services through others’ voices. In fact, a report from Social Annex discovered brands with Instagram and Facebook UGC content see as high as a 50% click-through-rate over branded images. Some businesses like GoPro, BarkBox and Adobe only publish UGC in efforts to promote their product. Other brands like Anthropologie, use UGC because it not only interacts and engages the user, but it promotes beautiful content for free. Just remember to ask to share before you Regram. As a brand, you have to value positive communication between your customers. 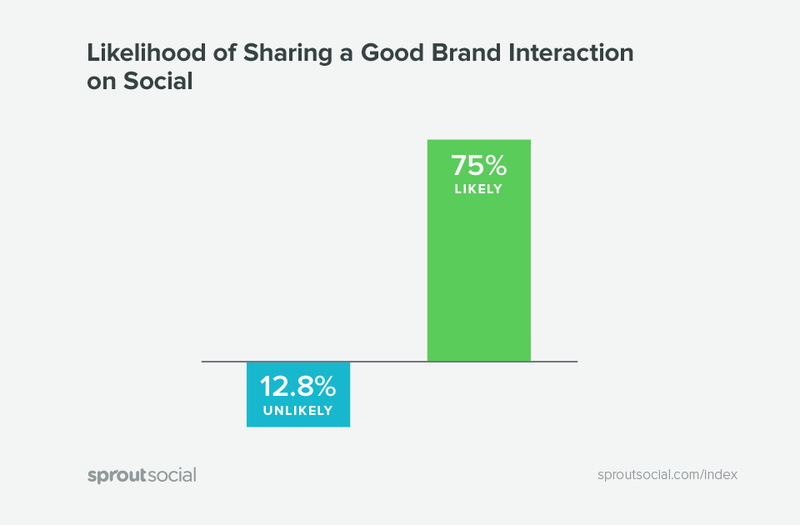 Our Sprout Social Q2 2016 Index discovered people are 75% more likely to share positive social media interactions with brands. This same notion should go toward your content strategy for Instagram as well. You don’t have to create a political barrier between you and your audience. But it’s always a great idea to promote a positive message. When your audience feel comfortable or empowered by your brand’s message, there’s a good chance they’ll follow you or become customers. Being positive on Instagram can take your brand a long way if done correctly. Throwback Thursday’s and Flashback Friday’s are some of the most popular types of content you’ll see on Instagram. However, you can take it a step further by giving a history lesson about your brand in a “flashback” piece of content. For example, the Cincinnati Reds often use history to get fans excited about the team (especially during the offseason). Your brand can take these exact same Instagram post ideas to promote content based on your history. You don’t have to be a century-plus old baseball team, but reflecting on your brand’s history could be a great source of content for your followers. For brands about release a new service or product, it’s smart to consider how you plan to hype the announcement. Instagram provides the perfect platform to promote teasers for a new major release. For example, Netflix does an amazing job promoting new shows without going overboard on the description. To promote the show Santa Clarita Diet, Netflix has released several small teasers about the show that will surely turn heads and inspire intrigue. Get people interested and hyped for your new releases with teaser videos or images. This is a great source of content for those releasing new products or services every month. Asking questions on Instagram is one of the best ways to drive engagement. Like we’ve mentioned before, being overly promotional can be off putting to your audience. However, asking a question invites your users’ opinions. United promotes its travel locations by asking questions around specific cities. Just this small amount of engagement promotes hundreds of comments per post. 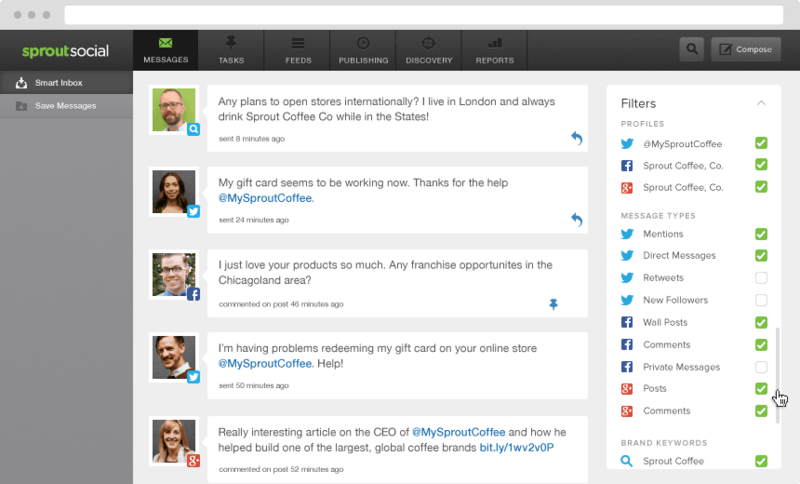 Ensure you monitor your incoming messages with a social media monitoring tool like Sprout. It’s easier to track positive and negative sentiments as well as those who simply need customer support or could be referred to your sales team. Much like promoting a positive message, get your followers to laugh and enjoy your content. Instagram is a space built for positive and humorous content. Whether it’s memes, funny videos or inspirational quotes, Instagram’s creative space can be welcoming. This gives your brand a great chance to show its funny side. We know this doesn’t apply to every brand, but there are ways to show humor without going overboard. BarkBox relies on hilarious videos and images of dogs, while attracting its biggest demographic–dog owners. You don’t have to be the class-clown of Instagram, but showing your humanistic side can make you seem less robotic and stale. One of the newer trends on Instagram is using specific themes with content. Much like the collage tip we mentioned earlier, video series are a popular way to spark content on Instagram. Califia Farms uses videos to educate its audience about the ingredients in its products. The video series is engaging and likely to get users to stop and watch the video when scrolling through. You can also use videos to tell a story to your audience. This Instagram post idea helps keep users coming back for more information or to get more of the story. Hiring social media influencers to take over your profile can bring some new light to a feed. If you feel like your content is getting a bit dull for readers, bring in an influencer who can create hype, build brand awareness and get users to trust your brand. A Tapinfluence and Nielsen study discovered influencer marketing efforts produce up to 11 times higher return on investment compared to traditional digital marketing efforts. You also don’t need major celebrities to promote content. Look for influencers who are popular on social media and who’s audience aligns with your brand. Free People often uses influencers to promote content related to its audience. Be sure of your audience’s hobbies and interests, and get influencers who can drive your brand on Instagram. Did you know 7 of 10 hashtags used on Instagram are branded? Stats like this should get you on board to using branded hashtags to engage new and current followers. Hashtag campaigns can help increase brand recognition and with the right tools, you can monitor them to see who’s talking about you. Hashtags have the ability to spread quickly, which is why so many brands use them. Before you start your visual content strategy, think of a branded hashtag your company can use to build around your Instagram account. Urban Outfitters implemented #UOonYou to build user-generated content of people using its products. Creating ways for your audience to interact and spread their own content will always be a smart marketing move. 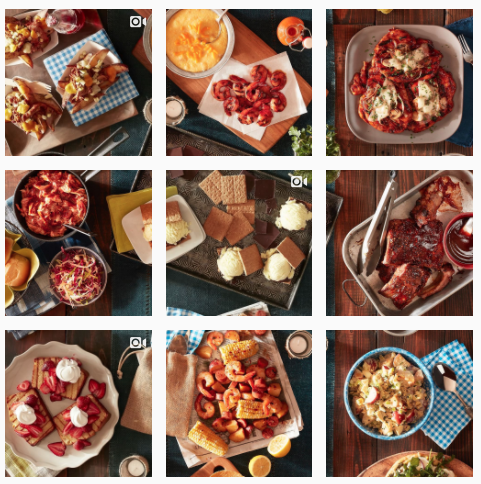 Using a hashtag to track action around your brand could work even better. A great way to push users to a specific site is through social media. According to Shareaholic, at least 30% of referral traffic comes from social media. Why not use Instagram to drive your traffic to your website? While you only have one link to use on Instagram (within your bio), it’s smart to make the most of it. Make sure you constantly update and remind your audience where they can make purchases or find out more information. It’s easy to forget about links while scrolling through Instagram. So keep your audience updated and post content that can drive them to something specific like a blog post. If you’re still stuck on coming up with Instagram post ideas, simply build off your current marketing efforts. For example, Canada Goose is currently working with the Sundance Film Festival in Park City, Utah. The location is cold, which makes the winter apparel company a great co-marketing partner. Canada Goose uses amazing shots and videos of all things Park City to promote the film festival and their marketing efforts. You can use the same strategy to build content around your most recent marketing efforts, while seeming less promotional. Hopefully these 15 Instagram post ideas helped get your creative juices flowing. Experiment with different types of content and use Sprout’s Instagram Analytics tools to find out what your audience resonates with the most.